Read another patient story about Budhi Bahadur who was injured during the course of his work in Malaysia. Budhi Bahadur used to work as a guest worker in Malaysia. 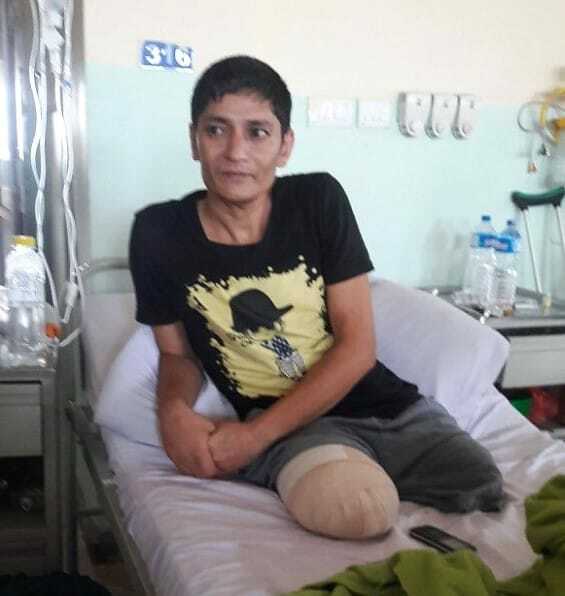 He is one of many people from Nepal who are injured overseas https://www.ncbi.nlm.nih.gov/pmc/articles/PMC3073876 and experience devastating consequences that probably make them wish they had never gone. Budhi Bahadur’s left leg got trapped in a machine. He was taken to a hospital in Malaysia but the funds he was given for treatment (Rs 11 lakh) were insufficient to cover his medical expenses. He returned to Kathmandu for further treatment and was admitted to hospital. Due to infection he underwent five progressive amputations of left leg. He then experienced a probable blood clot in his right leg and had to have that leg amputated as well as the clot blocked the circulation to that limb causing ischaemia. Budhi Bahadur comes from Siranchowk which is a remote village in Gorkha. He lived with his parents who were farmers and was married but his wife left him after his first amputation. He spends his day in NHEDF by weaving sweaters and making ladies outfits. He says that he is feeling better with the treatment he is receiving but deep inside he is depressed because he knows that he will not get the support he needs for the rest of his life. NHEDF is doing their best to try to provide him and all their other patients with the support they need in whatever ways they can to enhance their physical, emotional and psychological health and well-being and maximise their independence. Once Budhi’s wounds are healed he can then be fitted for prosthetic legs and will need intensive physiotherapy so he can learn to walk again. Previous Previous post: Sita was NHEDF’s first fistula patient.